Excel 2007 month on The New Paperclip! So you are a hotshot who doesn’t need to use a mouse! Fair enough, viagra 40mg power users tend to find they can do tasks quicker by using shortcut keys. Shortcut keys are combinations of keystrokes on your keyboard that can make the program do a certain task. The new Ribbon UI in Word 2007, Excel 2007, and PowerPoint 2007 is easier to use with a mouse, but if you want to use your keyboard shortcuts, there is a quick, easy, and visual way to find out what you need to press. All you need to do, is hit the “Alt” key. Simple as that. 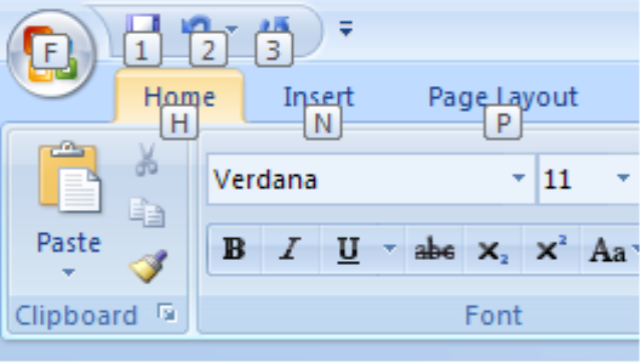 By pressing the “Alt” button in Word 2007, the keyboard shortcuts appear on top of all the different sections of the Ribbon. As soon as you go to another tab in the ribbon, if you hit “Alt” again, you can see all the shortcuts for each piece of functionality on that tab. So there you have it – all you need to do is remember “Alt” is your shortcut to keyboard shortcuts in Word 2007! (and Excel 2007, PowerPoint 2007 etc etc). Want to master the key shortcuts in Word 2007? TheNewPaperclip.com has put together a 5 day audio course that will help you remember and confidently use the key keyboard shortcuts in Word 2007 in just 15 minutes a day. You can find out more over at www.shortcutcourse.com, or you can enrol in the course now. I am sure almost everyone who is reading this post has Excel installed on their computer at work or at university. But how many of you really know what Excel is really capable of? So are you ready to excel at Excel? (sorry, viagra sale had to do it!) Stay tuned! This entry was posted in Excel 2007. Bookmark the permalink.